However, before we start - the Community team is recruiting a Research Software Specialist. If you are keen to run events, support Fellows, build bridges to support research software and gain data about the community to analyse and publish, then this role is for you! Applications close 18 October 2015 - this post is also open to international applicants. By the time you read this, the applications for Institute Fellows 2016 will have closed. There was a webinar earlier in the month explaining what we were looking for in Fellows and we had Fellows Natalie Stanford, Alys Brett and Sarah Mount in attendance explaining their reasons for applying and how they have benefitted from the programme. If you did not apply this year and are considering applying next year then you will be happy to know that funding for the 2017 programme has been confirmed. So with a year ahead of you what is the one piece of advice that I would offer; success is in the plans! If you have a plan for how you will engage your domain and move the lot of research software forward then you are half way in making an excellent application. For Fellows 2016, all will be revealed on Friday 4th of December when we announce our new inauguration of Fellows. Competition for the Fellows 2016 programme was extra stiff, we have 15 places and 113 applicants (this is up from 73 applications last year); not bad when you considered we asked more questions this year than last time. Over two-thirds of the reviewers are Fellows from previous inauguration years; this is very much in line with our aim of "Fellows choosing Fellows". In next month's update we will be able to let you know how many were shortlisted. The Fellowship programme is for UK based people who work in and with research software, this year we had a number of interesting approaches of application from international people. We would like to expand the programme to take in Fellows based outside the UK but are limited by the funding that supports the current programme. If you know of any other funding calls which might be relevant for us to expand the network in Europe or internationally, (we would like to hear from you email:info@software.ac.uk). The Institute’s Software Credit Workshop takes place at the Natural History Museum, London on Monday 19th October. The workshop is focused on best practice in software citation and credit, software based career paths in research organisations and how software fares in the evaluation of research.We have 53 people registered to so places are filling fast - only 7 places left! We have a who’s attending page, a list of resources that you should have some familiarity with before attending, a list of suggested discussion topics and the agenda is up. Instead of a long plenary session we will begin the workshop with short but information rich talks to help stimulate the discussion that takes place in the afternoon. The output of the workshop will be a report on what steps need to be taken and by which stakeholders (publishers, funders, research organisations and service providers) to improve the lot of software in reputational credit and we are planning on putting together a Manifesto on Software Credit to collect principles that stakeholders can rally around to move this important area forward. The workshop has become THE place to talk about software and credit internationally in the coming 6 months; if you have an interest in the area please register via Eventbrite. 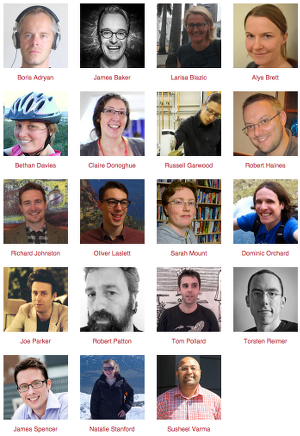 Institute Fellow Sarah Mount reports on the PyCon UK 2015 Science track. This was a new track at PyCon and gave a chance for commercial developers and research software engineers who both love Python to come together to work on software together; this happy union even withstood a World War 2 Nazi bomb! If you have any questions, comments or suggestions about the updates this month please feel free to get in touch.